55 1/8 by 72 1/16 in. 140 by 183 cm. 77 1/2 by 83 7/8 in. 197 by 213 cm. 22 1/2 by 38 1/2 in. 57.2 by 97.8 cm. 23 1/4 by 33 1/16 in. 59 by 84 cm. 22 by 25 1/2 in. 56 by 64.8 cm. 23 7/16 by 16 1/2 in. 59.5 by 41.9 cm. 47 3/4 by 47 1/4 in. 121 by 120 cm. 16 1/2 by 11 3/4 in. 41.8 by 29.7 cm. 25 5/8 by 19 3/4 in. 65 by 50 cm. 25 3/4 by 19 3/4 in. 65.3 by 50 cm. 24 1/4 by 19 7/8 in. 61.5 by 50.5 cm. Mitchell-Innes & Nash is pleased to announce a major Leon Kossoff drawings retrospective on view at their Chelsea gallery November 5 - December 21, 2013. The exhibition will include over 90 drawings, many rarely shown before, spanning six decades of work. This will be the artist’s first drawing survey in the US. The city of London has been Kossoff’s most significant subject. From the rebuilding efforts post-World War II to the recent gentrification of its neighborhoods, Kossoff has created a pictorial timeline of the city’s evolution. Schools, churches, swimming pools and streets teeming with pedestrians, “Leon Kossoff: London Landscapes” will present the full breadth of the artist’s deep engagement with the city. The earliest drawing in the exhibition, “Railway Bridge Mornington Crescent,” 1952, depicts an austere London, its sky filled with smoke produced by the coal-fired power stations of the time. By contrast, Kossoff’s more recent drawings of Arnold Circus, his childhood neighborhood, incorporate light, color and energetic gesture striking a more optimistic tone. In order to create an intimate dialogue between the viewer and the works, Mitchell-Innes & Nash will divide their space into three sections and install the drawings thematically making for a uniquely focused experience. The exhibition is accompanied by a fully illustrated catalogue with an essay by Andrea Rose, Director of Visual Arts, British Council, and curator of Kossoff’s exhibition at the 1995 Venice Biennale. “Leon Kossoff: London Landscapes” was previously on view in London at Annely Juda Fine Art and in Paris at Galerie Lelong. The exhibition will travel to L.A. Louver in Venice, CA early 2014. "Leon Kossoff has drawn and painted London relentlessly for more than six decades. Today, at 86, he can still be found sketching the street corners that have inspired him throughout his remarkable career. 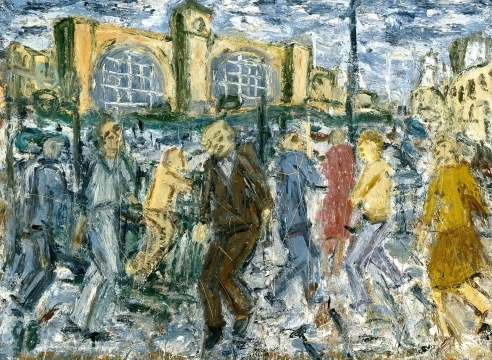 London is "Kossoff's Venice, his city of vista and movement," wrote Andrea Rose in the catalogue for "London Landscapes," a major exhibition that she curated for the artist's four galleries--Annely Juda Fine Art in London, Galerie Lelong in Paris, and Mitchell-Innes & Nash in New York, where it is on view November 7 through December 21, before moving on to L..A. Louver in Los Angeles." 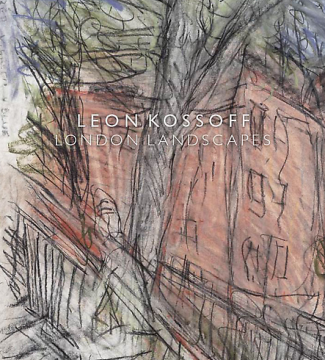 All his life, Leon Kossoff has felt compelled to draw and paint his native London. In the nearest that he has ever come to giving an interview, the artist, self-effacing as ever, explains how he has spent decades trying to get it right.